The Staff Selection Commission (SSC) every year hold this exam to recruit various appointments in government departments. Large numbers of applicants have applied for this exam. Candidates who have successfully submitted their application form with fees are eligible to download their hall ticket from given links…. SSC JE Paper 2 Exam date: to be declared. SSC will conduct PET & Medical in September 2016. There will be no interview for these posts now. Candidate's selection will be done on the basis of written and physical exam. UPDATES dated 09.08.2016 : SSC has uploaded Admit Card Download Schedule for CGL 2016 Tier 1 Exam. Details of Candidates Roll No., Date & Shift of their Examination will be available on website from 12 August, 2016. Those Candidates who have exam from 27.08.2016 to 04.09.2016. Their Admit Cards will be available from 16.08.2016 while Those candidates who have exam from 06.09.2016 to 11.09.2016. Their Admit Cards will be available from 27.08.2016. SSC Eastern Region has activated the link for Candidates to know their Roll No. 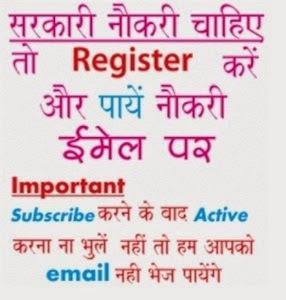 Candidates can check their Roll Nos from the link available below…………. 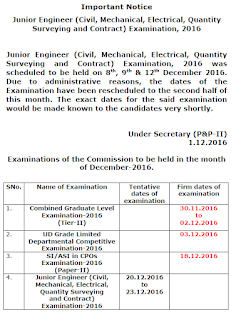 Tier-I of the examination is scheduled to be held from 27.08.2016 to 11.09.2016. The examination on the first three days viz., 27.08.2016 to 29.08.2016 would be conducted in two batches and thereafter from 30.08.2016 to 11.09.2016, the examination would be conducted in three batches per day. The timings in this regard are given below. Check Eligible Candidates List/ Roll No.